Grantown on Spey's Hannah McCook recaptured the form that won her the Welsh and Irish Open stroke-play titles in consecutive weekends and leads the prestigious St Rule Trophy 54 holes tournament at St Andrews. Hannah, pictured, posted two rounds of 71 over the New Course for an eight-under-par tally of 142 over the par-75 lay-out. In her second round she birdied all five of the par-5s but, conversely, bogeyed four par-3 holes, the fifth, ninth, 13th and 17th . 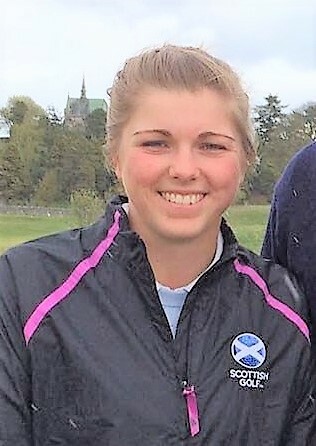 Hazel MacGarvie (Troon Ladies), the 2016 Scottish U18 girls champion, led with a first-round 67 but required nine more strokes to get round the New Course on her second circuit. She had four birdies and two double-bogey 5s at two par-3 holes. Defending champion Clara Young (North Berwick), having just returned from the University of Missouri, left her best form behind her in the States. She has had rounds of 78 and 81 for 159 at St Andrews, some 17 strokes behind leader McCook. 143 H MacGarvie (Troon Ladies) 67 76. 144 E Brennan (Trentham) 73 71, L Bailey (Kirby Muxloe) 71 73. 145 E Briggs (Kilmacolm) 70 75, S Burke (Ballinrobe) 70 75. 146 H Allsebrook (Shifnal) 74 72, F Liddell (Ger) 73 73, C Jaffrey (Troon Ladies) 73 73, C Gainer (Castle Royle) 71 75. 149 J Ross (Clandeboye) 73 76, C Casey (Hermitage) 75 74, E Slater (Gog Magog) 75 74, E Lewis (Long Ashton) 77 72. 150 J Bailey (Kirby Muxloe) 73 77, G Macdonald (Craigielaw) 78 72, B Bayles (Bishop Auckland) 73 77, M Garland (Selby) 77 73, G Batty (West Linton) 74 76, R Meekers (Netherlands) 71 79, G Price (Bude and N Cornwall) 77 73. 151 S Madden (USA) 75 76, K-J Stanley (Manchester) 77 74, K Andrew (Clitheroe) 72 79, C McGinty (Knowle) 72 79, A Collis (Letchworth) 77 74. 152 A Fowler (Ger) 73 79, T Mactaggart (Minto) 74 78, M Doyle (Portarlington) 73 79, J Hall (Bishop Auckland) 70 82. 153 C Taylor (Nairn) 76 77. 154 T Bettle (Ger), M Stasi (USA)( 77 77, G Blackman (Chelmsford) 76 78, S Wooster (Australia) 75 79, E Berlin (Sweden) 75 79. 155 H Morgan (Hallamshire) 74 81, M Dowling (Lucan) 76 79. 156 C Walsh (Castlewarden) 76 80, K Brodie (Strathmore) 78 78, K Beveridge (Aboyne) 77 79, M Giles (St Mellion) 77 79. 157 O Jackson (Pannal) 80 77, E Healey (West Lancs) 78 79. 158 S Sexton (Lahinch) 76 82, N Slater (Woodsome Hall) 78 80 E Hale (Troon Ladies) 79 79. 159 E Toy (Carlyon Bay) 81 78, L Brunt (Royal Birkdale) 81 78, C Young (North Berwick) 78 81, M Wood (Woodsome Hall) 78 81. 160 E Broome (Carus Green) 79 81.